The Cherry Blossom 10 Mile Run and I have a history. 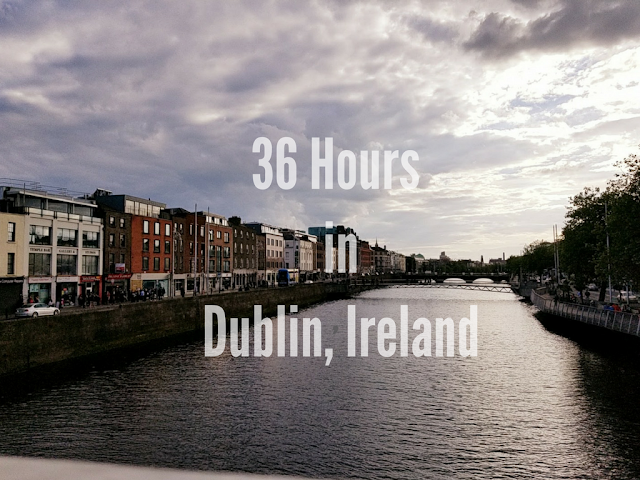 In 2011, I didn't run it after my flight from South Bend, Indiana (where I was speaking at a conference) was delayed due to maintenance forcing me to miss my connection and spend the night in Chicago. In 2012, I didn't run it after I woke up the morning before the race with a pinched nerve in my back and could barely walk. In 2013, I finally ran it...but almost didn't when I had an unexpected death in the family and had to go home for a funeral two days before. In 2014, I didn't run it when my the knee injury that still plagues me was at its worst. This year, for the second and last time, I ran the Cherry Blossom. Holly had come in for the race on Saturday afternoon and we had a low key post-race dinner (with drinks) at Tonic with Jenn. I didn't eat my normal pre-race meal of pasta and I didn't keep to my pre-race tradition of not drinking and I didn't feel great about that. Sunday morning, Holly and I were up bright and early and I just felt off. It didn't feel like race morning. I wasn't excited or nervous...I just felt like I was going to work or something. When we got to the Start, I lined up in my corral and waited for the race to start. There were several announcements about who was running and where they came from, etc. I heard all of them...or so I thought. I didn't find out until after the race that the course had been cut short by about half a mile due to an earlier car accident. Right off the bat, I didn't feel right. I felt like I was running on a trampoline...my feet just weren't hitting the ground the way they should have and I just didn't really want to be running. I was being elbowed and pushed from all directions and I was getting so frustrated. 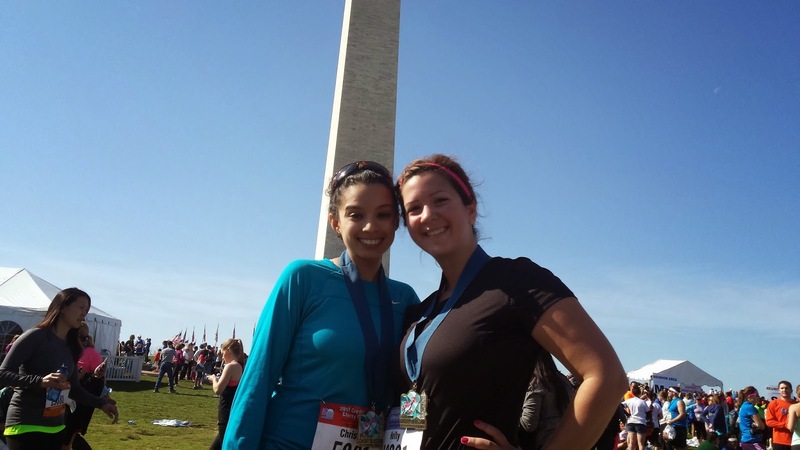 The race starts in front of the Washington Monument and then circles up and around the Mall to the Memorial Bridge. The Bridge is an out and back and by the time we got about half way back, my knee started hurting...a mile and a half in. A few adjustments to my form and pace and we hit the first water station, where I stopped to stretch. It was there that I decided to drop out. I would run to the Rock Creek Parkway turnaround and jump out, walk to Foggy Bottom and metro back to the race. I felt awful and I was so mad. I just didn't want to be running this race anymore. This was the first time since 2007 that the Cherry Blossoms hit peak bloom during the race and all of a sudden, I started thinking that I had to run through them. So, I decided that I would try to run a little bit further. By Mile 3, my knee felt better...better than better...it felt fine...something that has never happened during a race. So, I started to push the pace a little bit and I started thinking of something that a colleague said at work earlier last week. "Whatever you water will grow." I had been so negative during the previous few miles of the race and I was just harboring negativity. All of those negative thoughts and feelings were only growing the more I fed into them. I was thinking about this as we came onto Mile 4 and another water stop which I couldn't even stop at because of how crowded it was...but I knew that from this point on, every step I took would be beneath the Cherry Blossoms, so I pushed on. I can't name a single runner in DC who will tell you that they love running Hains Point. It's long, it's boring and it's typically unshaded, leaving the blistering sun to just wear you thin on any run...but this time? The trees created a gorgeous canopy over the road and it was beautiful to run through. Taken mid-run...because everyone else was doing it. No, I didn't stop mid course to take a picture, I kept moving. We came to the 10k mark and I started feeling so much better. I chatted with some runners and started to pick up the pace. I didn't want to worry if my knee would start hurting again, so I just ran. It felt so good to be pushing the pace. I haven't done that since the 2012 Cleveland Half. As we rounded Hains Point, I spotted someone that I thought looked familiar and tried to catch up to her. When I finally did, it was Courtney from Eat Pray Run DC! I introduced myself and we ran together for a little bit and then I got the urge to just let it all go. I started bolting. I loved watching the pace on my Garmin steadily get faster and faster. As we rounded Hains Point, I knew there would be an incline at the end (DC just loves to end you on an incline) but I powered up it. (Power up the hill, recover on the down hill...that's what I always do). I saw the 800 meter sign and then spotted my friend John among the spectators. I waved to him and pushed along. Just when I didn't think I could maintain that speed on the hill any longer, we were cruising down hill to the finish. 1:35:35. Only 10 minutes off my PR and a solid 20 minutes off of what I expected to run (25 if the course had actually been 10 miles). I was elated! As soon as I finished, I needed to lay down. I hadn't run a race like that in 2 years. I made my way to the finishers' area, snagged some water, a banana and my medal and picked a spot on the grass to lay down and wait for Holly (who PRd!). There you have it. I ran a great race. So why did I say that this would be my last Cherry Blossom? This was my 5th consecutive attempt at running this race and only my 2nd time running it. Even as late as Friday, I wasn't sure if I would be able to run. The Cherry Blossom is a really great race, but moving forward, I'll save my lottery spot for someone who will hopefully have better luck than I have. I'm just happy that I could "retire" from this race on a high note! 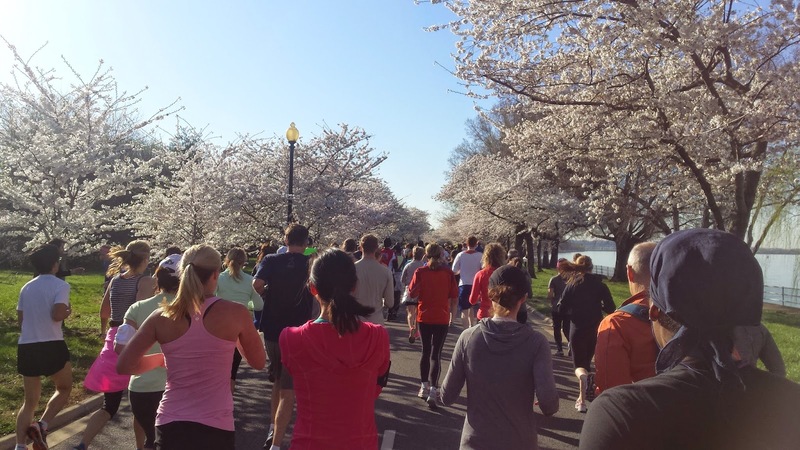 Have you run Cherry Blossom before? Is there a race that you have a history with? Ever retired from a certain race? If you ran this year's Cherry Blossom, don't forget to link up your recap with the Cherry Blossom Race Recap Party! Whoo hoo! Congratulations on an awesome race and way to push through the negativity! YAY! I was thinking of you on Sunday and meant to send you an email wishing you luck. Great job not turning around, so glad you finished and finished strong! Congrats to Holly on her PR, too! Let's plan a blate soon, yeah? Tea maybe? Congrats on a great race! I'm happy to hear that your knee bounced back after you stretched it. It is always nice to end on a high note. Congrats on your great race! 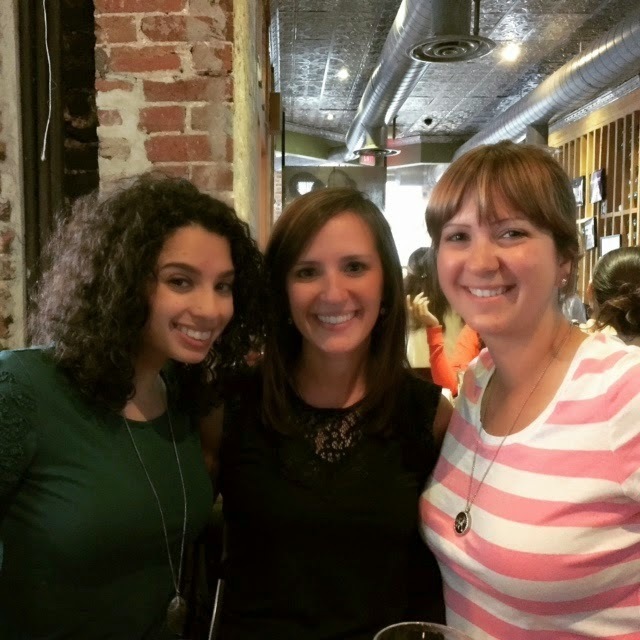 I was so happy I got to meet up with you two the night before--sorry if the pre-race night drinks didn't help! We'll have to get together again when there's no race the next day! I absolutely adore the cherry blossoms!! When I move back to the mainland I need to go to DC when they bloom. I am so happy that things got better, that you ran such a great race and retired from the cherry blossom on a high note! Congratulations on everything, you did a great job!! I hope you and Holly had a great time together too! Congratulations on such a great race! It's amazing how much a change in perspective affects the way something feels and how bearable it is. Yaaaay so happy!! You made great time, and I've had a few races where I felt off and uncertain in the days and hours leading up to it. Usually I was fine once I got started though. I would like to do the Cherry Blossom someday. Ok, very funny that you said you weren't excited for the race and it just felt like another normal day....because I literally wrote that last night in my draft post!! SO weird. I definitely had a lot of the same feelings you did at the beginning but knew I had to keep going--and I'm glad I did AND I'm even more glad that YOU did!!! You ended your Cherry Blossom attempt on a really great note, and even though I won't be there next year (it's definitely April 3rd...womp womp), I'll be back in 2017 FOR SURE! Well, and before that too, haha :) So thankful I was able to enjoy the weekend with you!! It's great that you finally got to run it and a PR too! congrats! WOW, so so very happy for you! Congrats on your race - awesome that while you thought you needed to DNF, you went back out there and got it done! That hill was pretty intense, I tried to attack it but may have attacked it too hard lol!